Search Results for "well site"
Tourists visit the Bradrona. Cardrona Bra Fence gradually became a well known site for breast cancer awareness as the number of bras grew to hundreds in Central Otago, New Zealand. Still shot of 8th century Prambanan Hindu temple at dawn against Merapi, most active volcano in Indonesia on background. Ancient stone architecture, well-known tourist site, Yogyakarta, Central Java. Busra al-Sham- a historic city in the south of Syria, as well as an important archaeological site, which is listed as a UNESCO World Heritage Site. aerial view of the ancient amphitheater. Aerial view of karst pillars at Wulingyuan National Park in China. Located in Historic Interest Area which was designated a UNESCO World Heritage Site as well as an AAAAA scenic area in China. Aerial top view of karst pillars at Wulingyuan National Park in China. Located in Historic Interest Area which was designated a UNESCO World Heritage Site as well as an AAAAA scenic area in China. 1955 - A graphic of the ESS underground shot and the atomic explosion itself are shown at the Nevada Test Site as well as the resulting crater. 1930s: Inside large well. 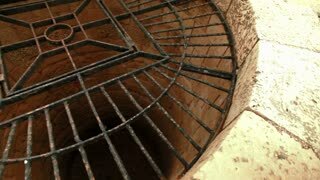 Two men look down large well in front of ancient pyramid. Tourists walk around archaeological site with ancient ruins. Flying past a fracking well toward homes right behind the site. A water channel leads from a well used at an ancient dwelling site. A stone circle stands beyond a well and hearth at the Drombeg stone circle site which is protected under the National Monuments Act of Ireland. 1955 - An atomic bomb blast explodes into a mushroom cloud and the shockwave levels a house as well as the mannequins therein at the Nevada Test site. 1958 - A storage site at Norton Air Force Base is shown as well as an airlift of ballistic missile parts and General Ben I. Funk speaks in his office.